Gyro – An American-Greek sandwich. Most food historians generally agree the name “gyro” and the current sandwich are both recent inventions originating in New York during the early 1970s. Gyros, as we know them today, are thought to have evolved from the traditional “Doner Kebab” of Turkey. Gyro is probably the most often mispronounced food name. Even its fans usually do not get the pronounced correctly – whether it is mispronounced as “jee-rohs,” “jai-rohs,” “gee-rohs,” The correct Greek pronunciation is “yee-rohs.” The varied names have geographical origins from different peoples’ languages. 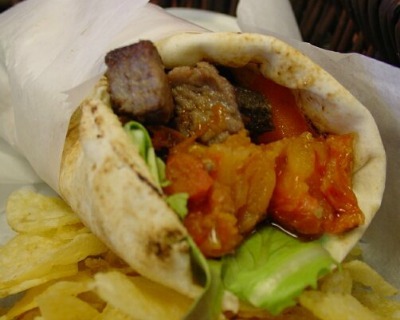 Gyros are believed to have originated in Greece. They are very similar to the döner kebabs of Turkey and shawarma of the Middle East, which are slices of meat, rather than a minced loaf. “A sandwich that is said to have originated 2,000 years ago is capturing the attention of Manhattan’s quick eaters. The sandwich, a Greek gyro, pronounce “year-oh” is a lamb, tomato and onion concoction nestled in a fold of a soft bread called pita. More than 30 Greek snack stores selling the gyro have opened in Manhattan in the last year, according to the proprieter’s estimates. In a heavily trafficked areas such as Times Square, three stores have opened in the last two months. – The Gyro, a Greek Sandwich, Selling Like Hot Dogs, New York Times, September 4, 1971. The ingredients of a American-Greek Gyro are: A proper gyro is made with meat cut off a big cylinder of well-seasoned lamb or beef. This meat is cooked on a slowly rotating vertical spit or gyro, implying the circular spinning motion of a gyroscope. The sandwich maker slices off strips of the warm meat when the sandwich is ordered, heats pita bread on a griddle or grill, and then serves the meat on the bread, topped with the sauce which is usually garnished with lettuce and tomato. Unfortunately, most Most American gyro are made with ground meat and not sliced. The ingredients of a Turkish Doner Kebab are: Slices of marinated lamb, mutton, beef, veal, or chicken which are stacked on a vertical spit and roasted at a vertical grill. It is served as a type of sandwich stuffed into Turkish bread, rolled into flat bread, or laid atop diced flat bread and topped with sauces. This type of sandwich has been known, and sold on the streets, by the people of Greece, the Middle East, and Turkey for hundreds of years. Greek historians believe that the dish originated during Alexander The Great’s time, when his soldiers used their long knives to skewer meat and kept turning the meat over fires. I really like the information given. It really helped me for the essay I had to to do over the gyr. I really like this site.